SEOUL, Aug. 22 (Yonhap) — A variety of South Korean alcoholic beverages and snacks will be served at the second round of inter-Korean family reunions later this week, organizers and corporate suppliers said Wednesday. The products to be served have already been offered at Korea-hosted international events, while others have been tapped because of meaningful product names. Kooksoondang Brewery Co. will table its most famous alcoholic beverage, “Bekseju,” at the reunion dinner. Made with local herbs, Bekseju is one of the longest-running brands first launched in 1992. It had appeared at previous cross-border family reunions and was served at the 2002 World Cup co-hosted by Korea and Japan. The name, which means “100 years of age,” also fits the family gathering, where most of the participants are elderly. South and North Korea have intermittently arranged reunions of families separated between them by the 1950-53 Korean War. The latest reunion is underway at the North’s Mount Kumgang resort. The first round, held for South Koreans who confirmed their surviving kin in the North, ends Wednesday. The next session, arranged for North Koreans who found family members in the South, will be held from Friday to Sunday. The last such reunion was in October 2015. Foods company CJ Cheiljedang was to provide snacks, including processed sausage, sweetened chestnuts and dried sea laver. Dong Suh Food will supply instant coffee sticks, and Jeju Province Development Co. will put the country’s No. 1 bottled water Samdasoo on the table. Hyundai Green Food, who is in charge of catering, chose Oriental Brewery Co.’s beer Cass for dinner and Orion’s Choco Pie for a snack. 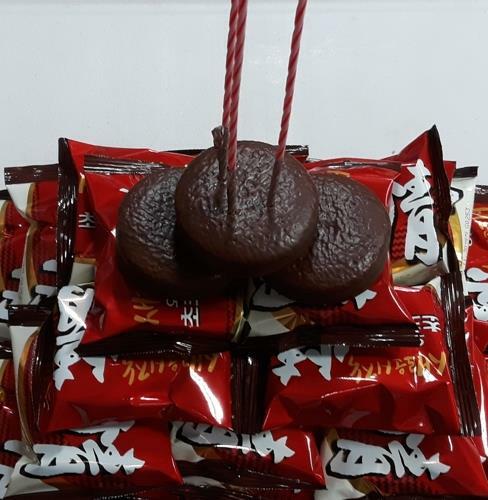 Choco Pie had been extremely popular with North Korean workers at the now-shuttered inter-Korean industrial park in the North’s border city of Kaesong.